Time was, science fiction about alien colonization presumed the invasion would come to Earth, from Mars. These days, the assumption has been turned on its head: The aliens are from Earth, and founding colonies on the Red Planet. And there’s less and less fiction involved in that idea. It very much appears that we will be off-planet in my children’s lifetime, and quite possibly in mine. This idea thrills a lot of people. It makes me feel like I can’t breathe. In January, National Geographic, in their typical and wonderful seeker’s spirit, sent me and a cohort of journalists to Space Camp in Huntsville, Ala., fulfilling a lifelong ambition I didn’t realize I had, for a simulated look at what being a space explorer might be like. (Space Camp is amazing.) We had a blast (as it were) designing heat shield technologies from household items and simulating a trip to the International Space Station, but the experience definitely confirmed my suspicions that I would be the world’s worst astronaut. Curiosity and courage and a command of engineering and physics? Those I could manage. But I don’t think there is any way of training someone to have the basic disposition of a space explorer—a sort of Zen master / fighter pilot hybrid with zero percent existential angst and an ironclad conviction that what you are doing will benefit humanity. Yes, it was deeply satisfying to say “Houston, we have a problem,” but even when I knew it was a simulated problem the anxiety wasn’t simulated at all. Feeling like I might tank the mission was a two-day adrenaline spike. Intellectually, I knew it wasn’t real, that I wasn’t going to crash a spacecraft, blow up the Moon, or subject a bunch of people I barely knew to lethal radiation levels. But emotionally, it was surprising how real it got. Later, I exchanged a couple of emails with a real-life PAYCOM (responsible for air-to-ground communication with astronauts; basically the person you are talking to when you inform Houston you have a problem). I asked her how she felt about the idea of colonizing Mars. She said she thought it was terribly exciting. I asked if it made her at all… sad. She found that question rather strange. But in all honesty, I don’t approach shows like Mars with a sense of excitement and wonder. I brace myself for existential despair. She asked me why, and I said I might spend the rest of my life looking for a way to articulate that. Mars is a different kind of colonization show than, say, The First or The Expanse. It’s a hybrid, part scripted drama and part docuseries, shifting between characters in the not-too-distant future establishing a Mars colony, and discussion among thinkers, scientists, technicians, historians, and entrepreneurs who have a lot to say about how it will likely happen. For National Geographic, forays into fiction are unusual, and the form is fairly experimental. In the first season, the series was fascinating and beautifully produced, but it also sometimes seemed anxious to prove itself by its documentary credentials—the drama-to-documentary shifts were rapid enough to border on intrusive, delaying real engagement with the characters. Right when some significant narrative development arrived, you’d be shunted back to footage of SpaceX employees or an interview with Neil DeGrasse Tyson. All equally interesting, to be sure, but it sometimes felt like an important conversation that kept getting interrupted. In Season Two, Mars has done precisely what its own Martian pioneers have done: It’s acclimated. It retains what was good about the first season—Ron Howard’s deft and high-quality production; an impressive roster of experts; interesting and likable characters; and above all a very compelling high concept—but it feels much more comfortable with itself, and transitions much more smoothly between present-day experts and the fictional future. The acting is stronger than in the first season—I have such a crush on Jihae, the singer and multimedia artist who plays mission participants/twin sisters Hana and Joon Seung—and the improved balance of scripted and documentary elements has largely shed its earlier tang of self-justification. In the fictional world, the colonists have established a settlement, research and technological development continue apace, dramas materialize organically from the circumstances (very literally organically, in some cases), and now that minute-to-minute survival isn’t taking up every single calorie, layers of being human come to the forefront as the colonists confront things like family and romantic relationships, emotional health challenges, or the most high-risk pregnancy of all time. Perhaps most importantly, the international confederation that put the colonists on the planet is joined by the first private industrial concern to hit the Martian surface—though they don’t stay on the surface for long; they’re miners. This inflection point is where the pedal really hits the proverbial metal, and where Mars develops a whole different level of gravity: The conflict between “pure science” and “profit” erupts instantly and angrily (and realistically) in a situation where failing to work together harmoniously will almost certainly prove lethal. And it lays bare a crucial and arguably chilling question. If we do this, can we avoid simply replicating the exact missteps we have always made on Earth? On the tabula rasa of a new planet, can human beings restart civilization with some hard-earned wisdom? Or are we doomed no matter where technology takes us? And if we are, what is the point? What is the point of literal transcendence if we cannot transcend greed, ego, power-mongering, and the totally false but strangely sticky notion that one person’s success must needs mean another’s failure? 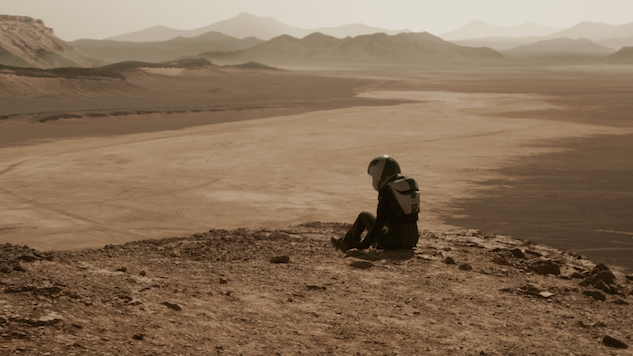 The eight episodes of Mars’ second season are very much concerned with those questions both on the drama and documentary fronts, and neither side has a ton of clear and comforting answers so far. Scientists are worried about industry. Industrialists are worried about regulation. Environmentalists are worried about the need to change the terms of our relationship with our ecosystem and what will happen on Mars if we can’t. Becoming a spacefaring species will change us. Including physically: One of the most intriguing philosophical, ethical, and practical conundrums raised by the aforementioned pregnancy is that children born on Mars likely would not (or will not) be equipped to survive Earth gravity, if they can survive to adulthood at all. Assuming they could survive (assuming they could be conceived, which is so far unproven), those children would be Martians. A massive evolutionary leap in a single generation. What does that mean? What should it mean? Meanwhile, back on Earth, we follow environmental justice activists pitting themselves against oil drilling in the Arctic, which the series argues (and I don’t disagree) is the remaining “frontier” environment from which parallels could be drawn to illuminate what Mars colonization might look like. Melting permafrost doesn’t just threaten low lying coastal land: It has serious public health ramifications—anthrax outbreak in Siberia, anyone? Commentary from a remarkably vast and 100% relevant collection of “big thinkers” (including NASA astronauts, psychiatrists, writers, colonization specialists, environmental scientists, infectious disease experts and… Newt Gingrich, among many others) speaks to the massive complexity of what humans would (will) be dealing with on another planet. There, as here, it appears we would likely be our own worst enemy, even compared to a landscape of -70 degree temperatures, no oxygen-rich atmosphere and 100 times the solar radiation we have on Earth. That, my friends, is sobering. Sometimes, what matters most about a TV program is that it’s entertaining; sometimes, it’s that it’s instructive. Sometimes it’s that it breaks some kind of artistic ground, issues a particularly vital call to action, or illuminates an under-examined aspect of the human experience. Sometimes it might do all of those things at once, though often one of those elements is privileged over the others and all too often none of them are particularly present. National Geographic’s programming has certain hallmarks, including a focus on the so-called natural world, an emphasis on very high-quality photography, and a generally educational mission. Scripted shows are not usually its jam, and even the ones that are technically scripted tend to ground themselves in non-fiction (Genius is imagined, but main characters like Einstein or Picasso certainly aren’t). Creating fictional characters is a new frontier for the network, and like any pioneering endeavor, it’s had its stumbles as Mars has developed. If you saw and loved the first season, you’re bound to be even more impressed with the second. If you found the first season aggravating, I want to recommend giving the second a chance; you might find it has… evolved. And if you haven’t seen it at all, it isn’t quite like any other space program I’ve seen. It’s a speculative show about speculation, a pioneering show about pioneers, and a sometimes flawed but sometimes brilliant show about the flawed but sometimes brilliant arc of human endeavor. It’s aspirational, and that is lovable and important. We are a species with a uniquely large and complicated brain and a stupefying inability to learn from our collective actions. Growth, evolution, the attainment of wisdom and empathy and sustainable peace? Of course they’re possible: They are merely statistically unlikely. Strip away the societal conventions we’ve lived with up to now (things like borders and tribes and economies and institutions) and you’d presumably have a chance to start over as something better. Instead of a race to hoard resources at any cost, or stratify according to brainless and destructive hierarchies, perhaps an ultra-hostile environment would be enough to unite people in the service of protecting resources and protecting one another in the process. And in the second season of Mars, we do see instances of that, of an alien planet making people more human in a positive sense. We also get a very clear picture of the all-too-likely flipside, and its all-too-predictable and totally unaffordable price tag. These are ideas we need to be thinking about whether we leave this planet or not. Season Two of Mars premieres tonight at 9 p.m. on National Geographic Channel.